ACRLog welcomes a guest post from Jennifer Ferretti, Digital Initiatives Librarian, and Siân Evans, Instructional Librarian, at the Maryland Institute College of Art. Beyoncé’s new album ‘Lemonade’ dropped April 23, 2016 as both a traditional album and a “visual album.” The visual album weaves poetry, music, cinematography, fashion, and literary and film references into an hour-long film that follows a woman going through stages of grief. The album was highly anticipated by two librarians at the Maryland Institute College of Art, Jennifer Ferretti, Digital Initiatives Librarian, and Siân Evans, Instructional Librarian. After watching Bey’s Formation music video and her performance at Super Bowl 50, Jenny and Siân realized the topics Beyoncé is exploring in her music provides a perfect opportunity to engage students through a popular point of reference. In seeking to make research more exciting to undergraduate art students, while also promoting critical thinking skills, Siân developed an instruction session which included a visual analysis of Beyoncé’s Formation, a discussion of Black Lives Matter, and an active learning component in which the students responded to Beyoncé’s Super Bowl performance by researching the Black Panther Party in the library catalog, research databases, and special collections. Jenny, also invested in developing critical thinking skills via popular culture, primarily through digital resources, designed a topical LibGuide which provides perspectives, opinions, and ideas referenced or directly address in Lemonade. Jenny: Hi Siân! What are you up to? Siân: Morning, Jenny! I’m just prepping for a meeting with a faculty member who is teaching a course on Art and Totalitarianism. You? Jenny: Sounds interesting! I got an email today that has me thinking about my unit of the library, Digital Initiatives, taking on archiving websites. Siân: Nice! I was having coffee with my dog, Pickle, this morning and I noticed that an article in City Paper came out about the Lemonade LibGuide you made. How many times has that LibGuide been viewed now? Jenny: Aw, Pickle! Let me check… 39,775 views as of today! Siân: Dang, girl! How does it feel to be internet librarian famous?? Jenny: <blushing> Honestly, I’m still taking it all in. It feels great to feel supported by so many people who work in libraries, archives, and museums. I love the fact that I can talk about Beyoncé and librarianship in the same conversation. I’m also really enjoying all the other projects that are popping up that are related, like the #LemonadeSyllabus. Siân: The guide was shared on Twitter by Sherrilyn Ifill, President & Director of the NAACP Legal Defense and Educational Fund, School Library Journal, and Kimberly Drew (aka @museummammy), founder of Black Contemporary Art and Associate Online Community Producer at The Met, among many, many others. It even has its own hashtag: #libeyrianship. That’s pretty epic! So, why did you choose to publish it as a LibGuide? What do you think about them as a means of instruction? Jenny: The shares have been overwhelming in the best possible way. One of the things I love about Twitter is that you can speak to a certain community, but what you say can also echo out to people you thought wouldn’t find what you do relevant to them. I’m grateful for every share and like! Honestly, I chose to publish the research guide as a LibGuide because the platform lets you organize information quickly and easily. I didn’t want a list of links. I wanted gifs, book covers, etc. LibGuides can be used for lots of purposes. Decker has been using guides mostly for programs. I find LibGuides to be most successful when they center in on a particular subject or research topic. After sitting in on your library instruction class based on Beyoncé’s Super Bowl performance and Formation video, the idea for a research guide on Lemonade just made sense. In fact, that class went so well and was so different from what I’ve seen here previously, could you tell us a bit more about the idea behind it? Siân: Sure! I think that was one of the first conversations you and I had about librarianship, because we were both so fascinated by Beyoncé as a means to critical instruction. I had just started working at MICA and I was so thrilled to learn that there are faculty here who are open to creative, critical library instruction. So, less than a month into my job, I convinced a particularly thoughtful and engaged professor to let me test out my “Beyoncé-based instruction session.” Her class consisted of first year students, mostly fine arts or graphic design majors, who had limited research experience and, in some cases, doubts about the relevance of library research to their work. Our goals were to get them to think about why research is relevant to their practice, to introduce them to different types of library resources, and to think critically about how they read and access information generally. We started with a visual response to the video Formation, mimicking the format of the crits they experience in their studio practice. Jenny: I have to stop you right there. I loved the visual response part of the session. As MICA alum, I know how important it is to learn effective critique skills, both giving and receiving feedback. I think it’s so interesting that you connected critique to information literacy in this way. It reminds me of Larissa Garcia and Jessica Labatte’s writing on metaliteracy, where multiple literacies such as visual, news, digital, etc. intersect. The session resonated strongly with me, so I can imagine it did a lot for our students. Siân: Aw, thanks Jenny! I honestly did that kind of on the fly! I’d been thinking about how to engage students who don’t see research as relevant to their practice. So, I used the video and our visual analysis of it as a jumping off point to discuss plagiarism, with the example of Beyoncé’s usage of footage from the Bounce documentary, That B.E.A.T. We looked at some of our Special Collections on related subject matter and, finally, in an active learning session, we had students researching the Black Panthers on Google, in our databases, and online catalogue. In the assessment survey, one student commented that this was the first she’d heard of the Black Panthers! I really feel that starting with a familiar, popular reference helped draw the students into the research process. I know you have similar thoughts about the ‘Lemonade’ research guide. Can you talk a little bit about your thoughts on the role of popular culture in librarianship? 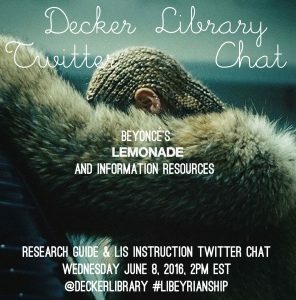 Jenny: The ‘Lemonade’ guide is the first time I’ve publicly connected a piece of popular culture with librarianship. I started thinking about film and television and librarianship as I watched The People v. O.J. Simpson: American Crime Story. Sounds weird, I know. There’s a scene in that TV series where a large group of protestors are gathered outside the courthouse. Vendors are also there selling merchandise about O.J. Simpson’s guilt or innocence. My first thought was, “did the producers see this sort of thing in the original news footage?” As an advisory board member on the Preserve the Baltimore Uprising archive project where we collect images, sound, and text from the 2015 Baltimore Uprising, I’m constantly thinking about how people, including librarians and educators, will use the archive now and in the future. Did you see the job posting for the Librarian for Literary and Popular Culture Collections at Brown University Library? Siân: Yes! I think it’s amazing that more libraries are aware that we need to be #relevant! I think that another one of your LibGuides, Understanding Civic Unrest in Baltimore 1968-2015, is also evidence of this drive to make research relevant to the community in which you work. I feel like the elephant in the fictional room of our conversation is critical librarianship. How do you think #critlib plays into your work as a Digital Initiatives Librarian? Jenny: Great question. First, I think less about how to stay relevant and more about how searching, analyzing, and disseminating information plays into many situations, including art. As Kenny Garcia wrote, “critical librarianship seeks to be transformative, empowering, and a direct challenge to power and privilege.” #critlib asks us to be self-reflective and conscious of ourselves and our institutions so that we don’t contribute to systems of oppression. This is what I thought librarianship was about, I just didn’t have a way of articulating this before I learned about #critlib. While at the peaceful protests and gatherings during the 2015 Baltimore Uprising, for some reason I felt like I should be there as a Baltimore resident, a person against police brutality, but also as a librarian. I don’t see a separation between librarianship and social justice. Now that I know more about #critlib, I understand why. Do you ever feel that way? Siân: Definitely. As librarians, we promote equal access to knowledge and educational resources, so our work shouldn’t be limited to the library, the classroom, or even the campus. I see my work with Art+Feminism, for example, as “information activism” that is an extension of my work as a librarian. Jenny: I’m so glad you brought up Art+Feminism! I’ve been a fan from afar. Before you arrived at MICA, I read a great ACRLog post about instructional design by Lindsay O’Neill. It was the first time I thought about critical instruction and design and I know we’ve talked about similar ideas. Could you talk a bit about any plans you might have for instructional design and how critical instruction differs from a more traditional take on library instruction? Siân: That’s a great question and one I feel only .5% qualified to answer! 🙂 In my work with Art+Feminism and in my previous job at Artstor, I’ve had the opportunity to work with lots of designers and UX researchers, as well as librarians. I loved Lindsay’s post! And it brought up a lot of food for thought about the cognitive overload in my current instruction practice. As an art historian and librarian I have perhaps an unproductive love of text. But, I see teaching as an agile, iterative process. I think a lot of critical instruction is based on this principle as well — teaching isn’t top-down, it’s a process of communication between the instructor and the students. So, it has to be ever-evolving. For anyone who wants an introduction to this, Eamon Tewell just published a literature review on a decade’s worth of critical information literacy and I really recommend Char Booth’s Reflective Teaching, Effective Learning. Siân: Ditto! It’s amazing to have inspiring colleagues who are doing important work, it’s like a daily reminder of why I became a librarian. And our #dailybey Slack channel is a definite highlight! Decker Library will be hosting a Twitter chat about the LibGuide and instruction on Wednesday, June 8 at 2pm EST. Follow along using #libeyrianship and @deckerlibrary. Larissa Garcia and Jessica Labatte, “Threshold Concepts as Metaphors for the Creative Process: Adapting the Framework for Information Literacy to Studio Art Classes,” Art Documentation: Journal of the Art Libraries Society of North America 34, no. 2 (Fall 2015): 235-248.